Collins was ranked by some as the top running-back recruit in the country in 2012. Personal: A native of Fort Lauderdale, Fla., Collins was ranked by some as the top running-back recruit in the country in 2012 and signed with Arkansas after considering Miami, Florida State, Florida and Wisconsin. He finished his college career with 3,703 yards rushing and 36 touchdowns and became the third player in SEC history to open his career with three consecutive 1,000-yard seasons — the other two are Darren McFadden and Herschel Walker. He ranked third in the SEC and 12th in the nation in rushing in 2015 with 1,577 yards before declaring for the NFL draft with one year of eligibility remaining. Played two years of Lacrosse in high school and also has recently taken up Irish dancing. Scouting report: Collins has the prototypical size and strength but isn’t regarded as overly speedy, with some referring to him as a between-the-tackles runner. Said to have exceptional feet for his size. 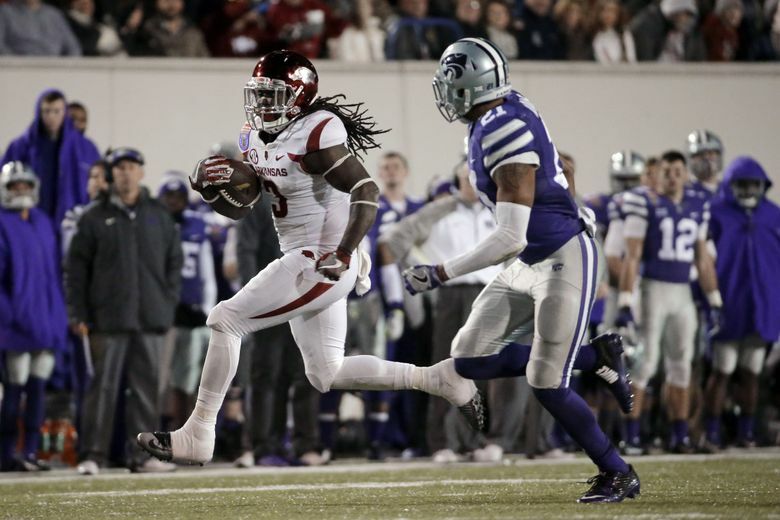 One notable issue at Arkansas was fumbles — he had 16 in 696 touches during his three-year college career. His fumble percentage improved as a junior, though, to one in 53 attempts compared with one in 38 and one in 34 his first two seasons, and the Seahawks say they don’t think that is an issue. Also regarded as a good blocker, as he often was used in pass protection at Arkansas. He is considered to have decent hands and said he’s confident he can produce as a receiver with the Seahawks. Quote to note: “This kid, talk about how we characterize our run game — big, physical, runners that run violent — he fits all of those,’’ Seahawks area scout Aaron Hineline.